Vehicles regularly entering parking garages leave water, oil and muck behind. Not to mention salt and de-icers tracked in during the winter months that can corrode the structure’s concrete and steel support system. Water Leakage – Leaking water is a clear sign that a parking garage is in need of repairs. The longer the condition is left unattended, the more expensive the consequences can become. Three indicators that water leakage is occurring are: exposed metals rusting, rust stains along the walls and efflorescence. Ponding Water – Water and parking garages do not mix well, so standing water is obviously an issue. A simple drain installation or protective waterproof membrane will prevent future, larger problems. Expansion Joint Failure – Failed expansion joints provide another avenue for water to penetrate and reach the reinforcing steel and T-to-T connector plates. Repairing expansion joints is much simpler than resolving issues created by corroded reinforcing steel and connector plates. Detecting expansion joint problems and reacting quickly to make repairs will be beneficial in the long run. Wear at the T-to-T joints, expansion joint failure and flange connection deterioration are commonly found in Double Tee Precast structures. Delaminated, Spalled, Horizontally Cracked and Vertically Cracked Concrete – Concrete is bound to crack at some locations. Delaminated or spalled concrete is when a piece of concrete detaches from the structure. Along with delaminating and spalling, vertical and horizontal cracks in the concrete also represent threatening areas of weakness. These issues are problematic as they can lead to structural damage because they allow water to reach the garage’s reinforcing steel. 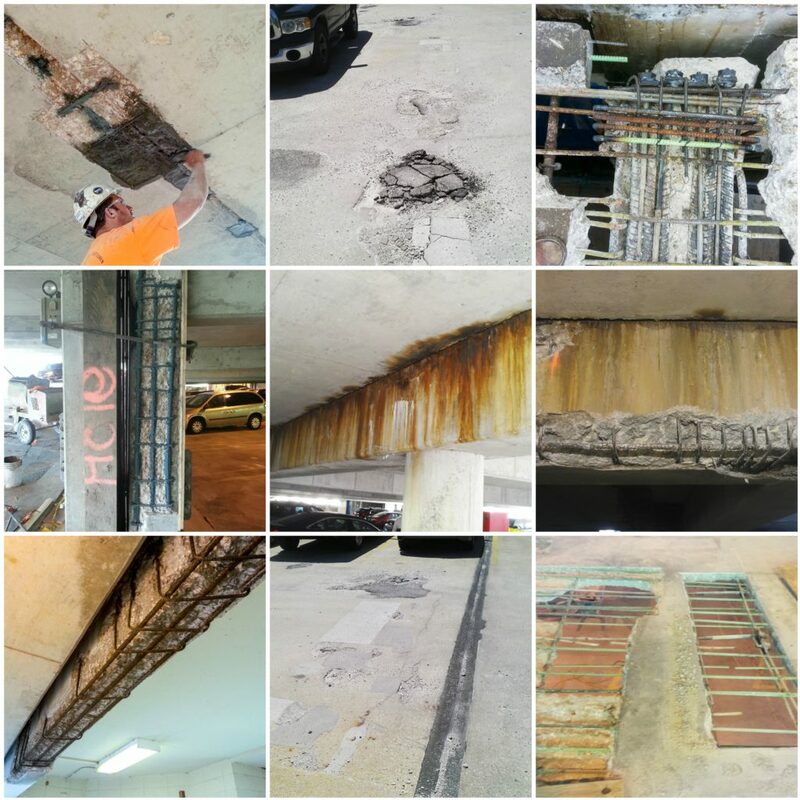 This type of damage is commonly seen on Post-Tensioned and Conventional Cast-In-Place concrete parking garages. Exposed Rebar (Reinforcing Steel) – If rebar can be seen, there is a problem that deserves swift attention. When rebar is introduced to water, it corrodes and expands up to eight times its original size. This condition usually is the result of a crack in the concrete that allows water to travel through and reach the rebar. The force of the expanding rebar causes more damage to ­the concrete around it, which creates greater access for water and more corrosion. It is imperative to stop this compounding cycle as soon as possible. 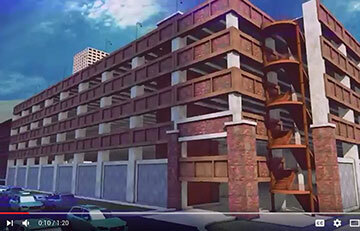 “Recent strides in technology have provided new and effective ways to extend the life of parking structures,” said Pogue. These advances consist of conventional means, including better coatings and sealants, as well as all new methods of handling challenging concrete repairs.